Removing a stump isn’t as simple as it sounds. And while you can utilize our stump grinding services to take a stump to below grade, completely removing the stump is another task altogether. When you need a stump completely removed, including its roots, you can count on us here at JRP Tree & Demolition, your local Houston source for tree care services. Let’s delve into our method, our tools, the steps we take after removing your stump, and what sets JRP apart from other tree care providers. Don’t ruin your back or your truck trying to pull out a stump. Let us take on the heavy lifting. Trunk roots are especially stubborn, and it requires powerful machines to remove a stump from your landscape. 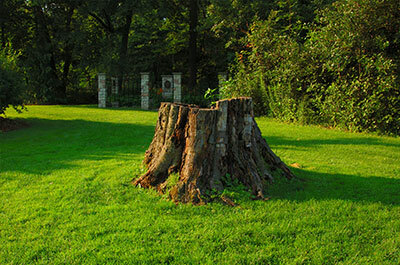 We strive to remove a stump in its entirety with specialized skills, as well as tools. We utilize excavators and saws, among other tools to completely remove your stump. We can also remove specific roots, including those that are near your home or driveway, or those that are interfering with another landscaping project that you’d like to complete. Once we’ve removed your stump, we can bring order back to your landscape by backfilling the hole that is left behind (we can use topsoil if you prefer), and grading the landscape until it is flat. If you’re planning on placing sod in the space where your stump once sat, we can prepare the soil for your new lawn. Here at JRP Tree & Demolition, we do our utmost to ensure that your landscape is pristine. We provide a variety of services, including excavation, land grading, stump grinding, and of course, stump removal, so that you can have your project completed in one fell swoop. If you’re ready to get started, get in touch with us for a free quote.